Attention all fathers, dads, papas, old guy, daddy, whatever you’ve been responding to all these years please join us June 15-17th for our 2018 Father’s Day Fishing Frenzy, back by popular demand! 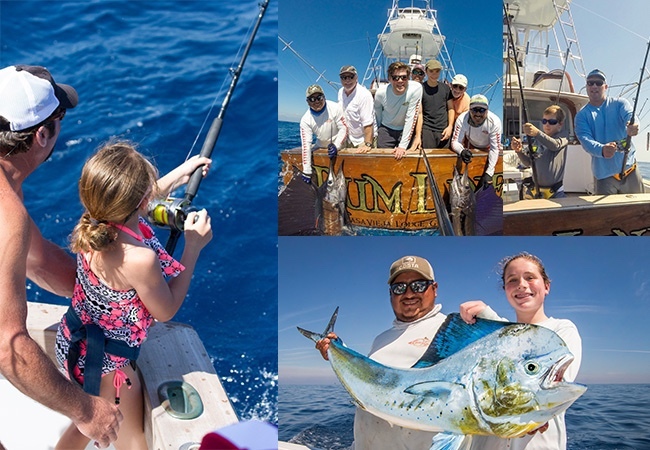 Teams of four anglers will have a blast releasing sailfish with friends and family. Higher points are given for double and triple sailfish releases that include dad! Give us a call at the Miami Office to secure your team boat or email us here for more information. The tournament entry fee is $180/angler. We hope to see you at the Triple F! You’ve heard us say it once, and you’ve heard us say twice at the lodge, but for the last time pretty please re-book your dates for 2019. We absolutely love our regular clients but unfortunately you control your Guatemalan destiny, we simply make it come true. Don’t let your dates slip away, which is highly likely due to the recent demand. The early bird gets their exact dates, and favorite boats, the late bird settles for what’s left! We asked you to tell only your best friends about Casa Vieja Lodge, but some clients seem to have a lot of those! We are now booking a year in advance during the snowbird season. Please don’t let your tropical winter fishing getaway do just that! 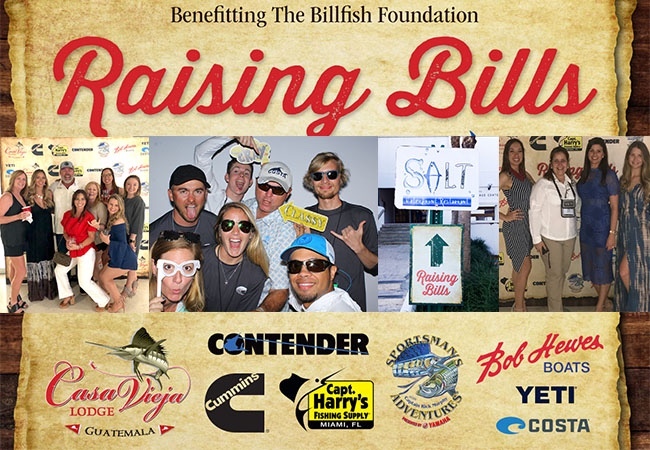 During the 2018 Miami International Boat Show Casa Vieja Lodge teamed up with Cummins Engines, Contender Boats, Sportsman Adventures, Capt Harry’s, Bob Hewes Boats, Costa del Mar, and YETI and hosted the 2018 Raising Bills party to benefit The Billfish Foundation. With a beautiful setting at Salt Waterfront Restaurant on the campus of University of Miami Marine School of Science, industry insiders and VIPS were able to casually relax after a long Saturday at the Boat Show and exchange a few laughs and dance moves. Music by the Jay Valor Band put the crowd into good spirits and just under $3,000 bills were raised to benefit TBF. The weather is warm, the seas are calm, and the fishing is HOT! Throughout the entire month, February has brought us double-digit numbers and we are expecting these numbers to keep growing well into the summer. The mahi-mahi have also been making a regular appearance not only in the water but on our plates! For John Hager, a trip to Casa Vieja Lodge was a bucket list item for his late father that he never got the opportunity to experience. So John came down in January 2017 had a fantastic time, and has now made it an annual trip! This past January he used CVL as a venue to reunite with an old friend from 20 years ago, and his son, and they fished for 4 days aboard the El Cadejo. We cant wait to see you next year! February 13th-24th, the Poco Loco (44′ Kincheloe Nickerson) with Capt. David Salazar, had 299 raises, 254 bites, and 149 sailfish releases. They also had 2 marlin raises, 4 tuna, and 12 mahi-mahi. February 13th-24th, the El Cadejo (35′ Contender) with Capt. Efron Rizzo, had 224 raises, 149 bites, and 76 sailfish releases. They also had 5 marlin raises, 4 marlin bites, 3 marlin releases, and 15 mahi-mahi! February 13th-28th,the Afinity (39’ Billy Knowles) with Capt. Nico Melendrez, had 281 raises, 212 bites, and 139 sailfish releases. They also had 2 marlin raises, 2 marlin bites, and 19 mahi-mahi! February 13th-28th, the Finest Kind (40’ Whiticar) with Capt. 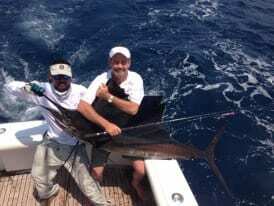 Chris Sheeder, had 295 raises, 195 bites, and 108 sailfish releases. They also had 7 marlin raises, 4 marlin bites, 1 marlin release, and 10 mahi-mahi! 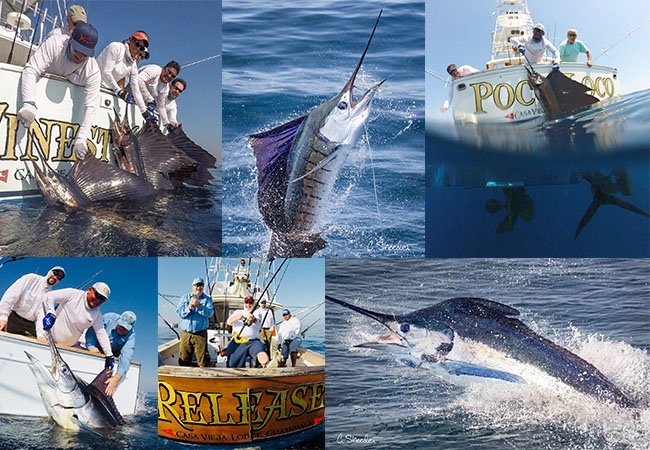 February 13th-28th, the Intensity (37′ Gamefisherman) with Capt. Mike Sheeder, had 397 raises, 321 bites, and 209 sailfish releases. They also had 4 marlin raises, 2 marlin bites, 1 marlin release, and 11 mahi-mahi! February 13th-28th, the Makaira (37’ Rybovich) with Capt. Jason Brice, had 280 raises, 237 bites, and 129 sailfish releases. They also had 3 marlin raises, 1 marlin bite, 1 marlin release, 5 tuna, and 26 mahi-mahi. February 13th-28th, the Pez Raton (35′ Contender) with Capt. Franz Hoffman, had 201 raises, 132 bites, and 62 sailfish releases. They also had 5 marlin raises, 3 marlin bites, 1 marlin release, 2 mahi-mahi, AND 1 roosterfish. 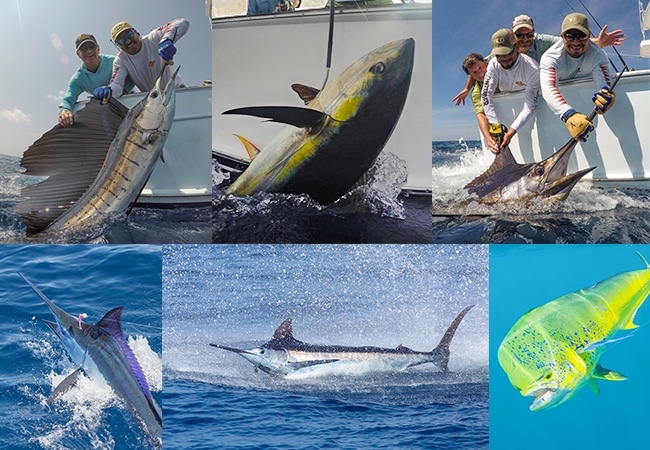 February 13th-28th, the Release (37′ Merritt) with Capt. Chico Alvarenga, had 340 raises, 258 bites, and 135 sailfish releases. They also had 3 marlin raises, 2 marlin bites, 2 marlin releases, and 28 mahi-mahi.